The update to 0.5 of iToday has made some changes to both the Settings and the lock screen display. The Settings have changed quite a bit, you now have the options; Enable iToday, Video Settings, Date Setting and Restart SpringBoard. The Theme option has been deactivate and a Display Settings has been added but is not available yet. One new feature on the lock screen is that you can now scroll the page. 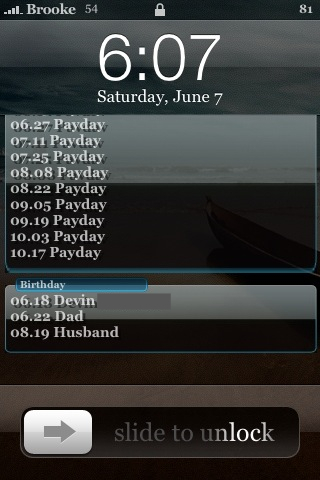 It will display the next ten Calendar events and then the list of Birthdays. To see all the Birthdays, just scroll down. I also noticed that the Calendar now displays reoccurring events which it did not do in the previous version. The battery icon has been moved to the top of the screen and now displays the battery percentage. Both the percentage and the weather update when the lock screen turns on…which is a cool feature. Overall, this application is coming along. iToday is avilable through the Skrew source. itoday won’t show on my lock screen. I have skrew common. now what should I do? Do you have the newest version of Skrew Common…version 1.37? If so, make sure you turn on Enable iToday in the Setting of iToday and then Restart SpringBoard. If that does not work, I would restart your iPhone and then try to enable iToday and respring your iPhone again. Also remember that this application is still in beta, which is a good thing because it is not exactly the most stable application. Will iToday stay free? Cause deleting my intelliscreen cost me enough courage, if i now install itoday and they will also charge i will drive into madness ! I finally figured out what i had to do. If you double tap the screen it goes to hide. Then to get it back just swipe to the right it comes back. I found this out after being frustrated at the app s i started to swipe double tap and stuff then it faded in and now its working just fine. Thanks brooke. What I don’t like is that the weather does’t update by it self. Wow I like this app so far, If I could change the display arrangement and remove some stuff “SMS and Phone because in on a ipod touch” or have a option to remove the Calendar events and ect because I rarely use my calendar XD. It would be interesting to have like a full screen battery indicator, or full screen weather with the weekly forecast.